Surrounded by majestic views and Karst Mountains lending its shadow to the Li River, Xingping Town is located 27 kilometres from Yangshuo and 63 Kilometres from Guilin City on the banks of the Li River. 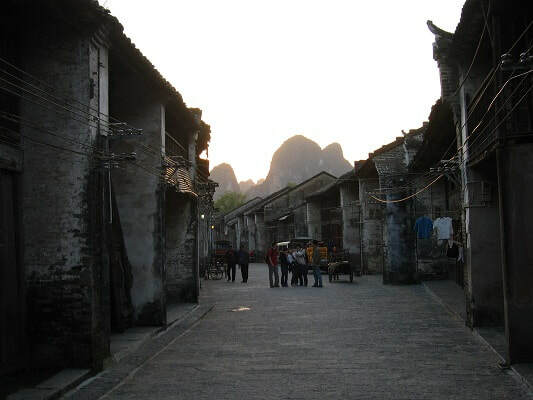 ​Xingping town was originally set in 300 AD and was considered as the central Yangshuo town before the main town was actually built. This town is impressive because of its intact architecture from its origin till date and the local people can be observed following their own daily schedule, despite being so close to the modern cities. Lotus cave is another major attraction close to Xingping as well as the ‘20 Yuan note spot’ where they can take impressive pictures of the Karst mountains, blending in with the Li river making their journey all the more memorable. If you are in the mood for exercise, you can opt to climb one of the adjacent hills and see a bird’s eye view over the countryside, which offers a gasping view of Xingping village and the other scenery surrounding it. It takes a whopping 1159 steps to reach the spot but according to various visitors the entire experience is worth all the effort. Xingping is a small town where visitors can choose to walk around as they experience the customs followed by locals here being over thousands of years. The food available is very traditional Chinese food made even more enjoyable by the hospitality of the people residing in Xingping Village. Add Xingping to your next Guilin or Yangshuo Tour. Interested in visiting Xingping on a Tour? Wendy Wei Tours offers a variety of different packaged tours as well as custom tours including Xingping, among other attractions and destinations. To find out more, please visit our Tours page or Contact Us directly to find out more.